Easily fits most standard size toilet seats. Raises the toilet seat height by 4". 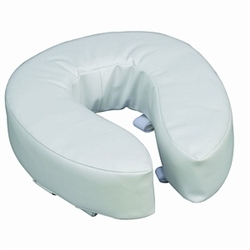 Comfortable foam padding helps minimize pressure points. Easily attaches to seat with hook and loop straps. Constructed of foam padding upholstered in vinyl.